One of the first tools your personal injury attorney may use in your automobile accident case is a scale diagram map of the scene of the accident. This can be sufficiently detailed to include cutout cars that can demonstrate where the plaintiff’s car and the defendant’s car were, as well as any other traffic in the vicinity. However, based upon the facts of your case, something more, or less, may be needed. Magnetic accident boards are typically prepared by computer graphic companies, but the information the graphic company uses is in most cases supplied by a private accident investigator. The magnetic boards are designed to scale and allow for the cars, also designed to scale, as magnets, to be moved by the witnesses in an effort to re-create the actual events of the incident. Clearly, the benefit to the testifying witness is the ease of explanation. That is, rather than having to convey only in words that which occurred, you, as the witness, can show dimensional relationships with the guidance of your personal injury attorney. A street map can show where you live, where you were going and the route you took leading up to the accident. The magnetic board becomes a tool to show how exactly the accident occurred. You place your and the defendant’s cars on the board at their locations at the time of, and immediately prior to, impact. An additional benefit may be if the diagram or board has a distance grid on it. This will permit a calculation of where each car was at various time spans before the crash. This may be a critical factor in demonstrating why you could not have possibly seen the defendant’s car in the moments leading to the accident. 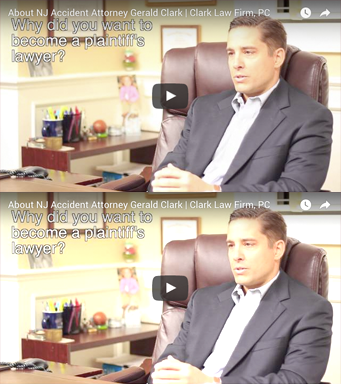 Gerald Clark, a personal injury attorney in NJ, understands the complexities of issues in a personal injury case. Mr. Clark offers a free, initial consultation without obligation. Call (877) 841-8855 to make an appointment.